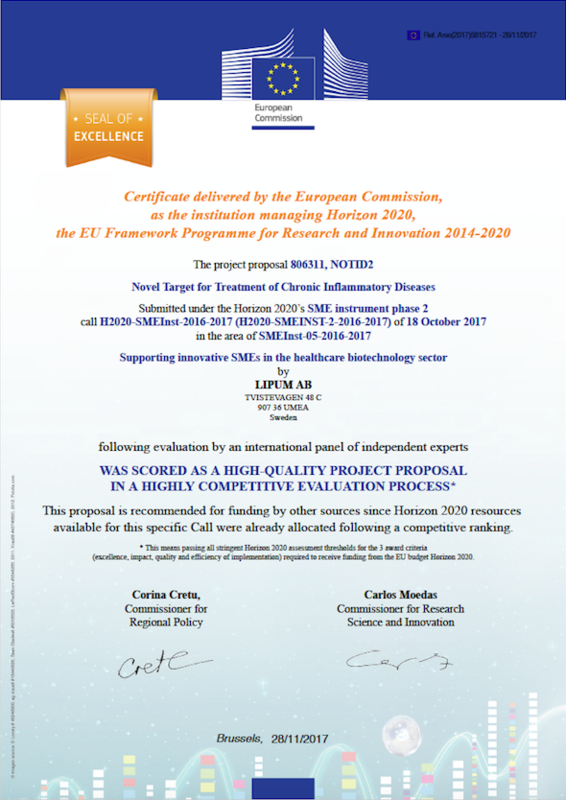 In response to Lipums application ”Novel Target for Treatment of Chronic Inflammatory Diseases” for SME Instrument 2 funding by EU’s Horizon 2020 an international panel of independent experts scored it as a high-quality project proposal in a highly competitive evaluation process. The ”Seal of Excellence” certificate is issued for projects that pass the threshold but cannot be funded under the available call budget. It is delivered by the European Commission, as the institution managing Horizon 2020, the EU Framework Programme for Research and Innovation 2014-2020.